How did I come up with ‘ziepen’ if it wasn’t meant to be used in such a context? Ziepen describes ‘the brief pain through pulling of hair’. The meaning of ‘brief pulling pain’ can probably be transferred easily, e.g. in my situation to my eye. How did she know what the word meant for me, i.e. what kind of sensation I was trying to describe, without actually knowing it? The German cluster zw (cf. tw in English) is generally related to the number two: zwei (two), zwischen (between), Zwilling (twin)… However, there are several exceptions, e.g. zwirbeln (twirl) and zucken (twitch). Although these don’t carry the specific meaning (two), they do seem to be somewhat semantically related. Studies have shown that when asked to invent/interpret new words, participants look at phonesthemes in their language to follow a predictive pattern. This could explain why my friend was able to tell what I meant without actually knowing the word: She might have associated ziepen with zucken which describes a brief, usually involuntary movement. In general, how do we agree on words for particular sensations while we can’t tell what they feel like for anyone else, and how do we learn them? When we learn new words we understand their meanings by, for example, being pointed at the ‘thing’ or the ‘action’ they (nouns and verbs) describe. When it comes to internal experiences like perception it all gets a lot fussier. How do you know that the pain I experience is actually painful? 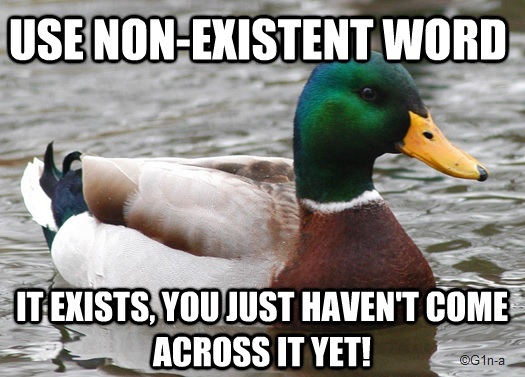 This touches upon linguistics, philosophy and biology. All our knowledge comes in through our senses which are subjective and unreliable (as revealed by the many ways in which they can be manipulated and deceived, e.g. hallucinations and optical illusions) and truth is defined by language which is more of an agreement than an objective state. Pears (1971) explains that an empiricist view on sensations involves accepting that the general meaning of e.g. ‘pain’ involves two aspects: 1) the set of teaching links 2) the inner reference (private sensation). Only a primitive empiricist would think it only involves the latter – a language only about private sensation would be unteachable. He says that “our language of sensations is not really teachable, and we do not ever really communicate about such matters” (p.158). So, while we can ‘teach’ nouns and verbs that can be pointed at in the world, we cannot teach words that have their meaning lying within ourselves. We all live in our own worlds, we can never know for sure about other people’s sensations, so I guess instead of being ‘taught’ we can only infer such information from cues: When I bleed, I’m hurt and I’m in pain. So when you bleed, you are probably experiencing pain too. It is incredible how we manage to communicate things we don’t have words for, by using common words or inventing new ones. Life is miraculously mysterious and mysteriously miraculous! Oxford handbook of Wittgenstein (2011). Oxford: Oxford University Press. Pears, D. (1971). Wittgenstein. London: Fontana. Waugh, L. (1994). Degrees of Iconicity in the Lexicon. Journal of Pragmatics, 22(1), 55-70. This entry was posted on 18/11/2012 by G in Academia, Linguistic Musings and tagged German, meaning, neologism, philosophy, phonestheme, phonesthemic pattern, semantics.